Left 4 Dead 2 Pre-Halloween Extravaganza Game Night! Tonight! 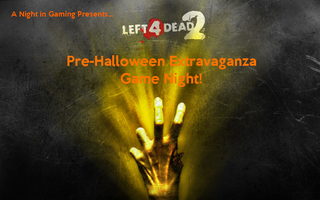 A Night in Gaming proudly presents the Left 4 Dead 2 Pre-Halloween Extravaganza Game Night! There is no better way to get ready for Halloween than slaying some zombies! Join us tonight at 9:00 PM EST (that's 6:00 PM PST for you West Coast folks) in the TAY Steam community chatroom! More details inside! I'm DisturbedShadow on Steam if you haven't already added me! And if you haven't yet, be sure to join the TAY Steam Community! As always, you can find everyone on the TAY Gaming IDs spreadsheet and add yourself if you aren't on it. That's it for October, be sure to check out the November Game Night schedule to find out what we're playing next month!